Today at 12 January 2017 is released the secondary project in GoS Loader, currently working for Patch 6.24 & 7.1. GoS EXT (for League) is a tool, which works fully externally. 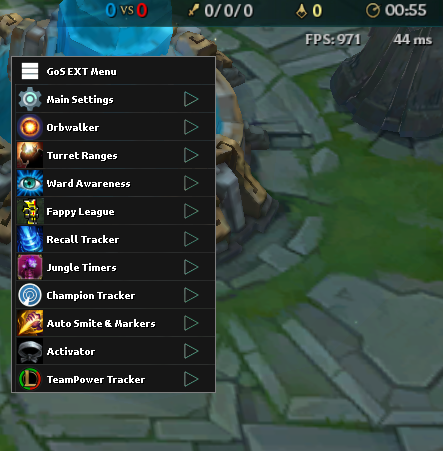 Meaning it doesn't inject any bytes into League, draws in a separate DX9 overlay and performs keyboard and mouse clicks to simulate real human behavior. This new project will be completely paid in order to keep a lower profile and keep it undetected, yes you can't get banned for using it, it doesn't work the same way as all other league scripting engines which inject, and call engine functions. Me and a number of few more people have been using it for at least 6 months now in main accounts, can assure it's completely safe. The project works again in LUA, where the API is fully reconstructed to work way faster (as it should) and cause no drawbacks. Remember that you can't use GoS Internal scripts in the GoS External project, it will simply not work that way. Here you can click to find out the starting API list about it, or get an idea how it's made. -> which = "string"; "leftIcon"|"rightIcon"|"icon"
What will happen with the old GoS (Internal)? Well do not worry, i will keep on supporting it, and it will keep on being completely free, only if you want you can buy Sub for it to unlock VIP scripts and support your favorite Developers. But it's price now is 9$ instead of 10$. 1) It is super safe to use, literally your second and probably last chance to script on your main and NOT get banned. 2) It's pretty fast and causes NO FPS DROP, since it draws into an external overlay window.